Filmmaker Paul Solet's new documentary Tread had its world premiere at this year's SXSW Conference & Festivals in Austin, Texas this month. The movie focuses on the bizarre circumstances of what happened in the town of Granby, Colorado on June 4, 2004. 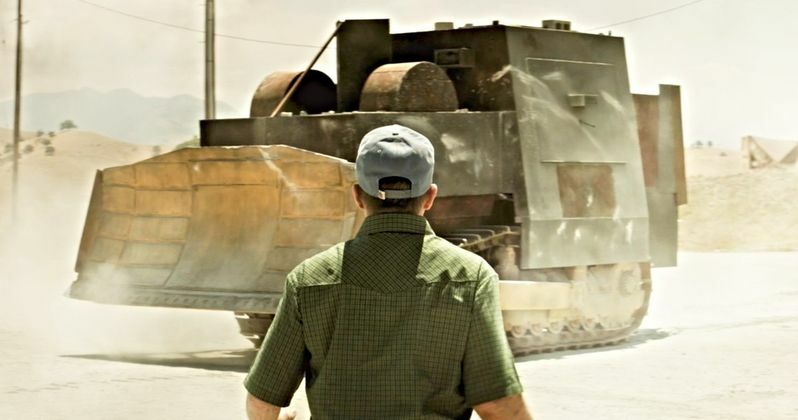 That was the day Marvin "Marv" Heemeyer began his rampage against the town with an armored bulldozer, nicknamed by the press as the "Killdozer." Feeling he'd been wronged by the city and that he was doing God's work, Heemeyer had obliterated many targeted structures in Granby for what he deemed an appropriate revenge. It's genuinely an extremely compelling story which has been in dire need of an extensive documentary for nearly 15 years, and thanks to Solet, that day has finally come with the release of Tread. An outsider to Granby, Heemeyer had no relatives nearby when he moved into the area a decade or so before the incident. As explained in the movie, he opened up his own muffler repair shop and had been described by many of the locals as a likable person. Typically, he got along well with his customers and was noted to treat those around him well. However, Heemeyer had a darker side to him when it came to those who he'd felt had wronged him, once threatening a man over a dispute about paying for a muffler service job. The man used an intermediary to pay Heemeyer back, but this was just a sign of what ultimately was to come. As the story goes, things later grew very tense between Heemeyer in the town. He had been getting hit with multiple fines for his business due to various reasons, and a zoning dispute ultimately led him to reluctantly sell his land for Mountain Park Concrete to build a concrete batch plant. Feeling that he was being ran out of town, Heemeyer purchased a bulldozer and began plotting his revenge. Tread intricately documents each of the painstaking steps Heemeyer took to build the infamous "Killdozer," which the welder had been essentially working on 24/7. The result was an inpenetrable tank which Heemeyer would use to carry out his ultimate revenge. Of course, the rampage itself gets plenty of coverage in the doc. Footage from news reports are shown of the actual bulldozer in action, taking out building after building. Because Heemeyer had built the contraption with no entry point from the outside, responding officers were completely helpless to put a stop to the madness, despite their best efforts. Starting with his own former muffler shop and the new concrete plant, Heemeyer destroyed over a dozen buildings, causing over $8 million in damages. Every building owner who saw their structures demolished had apparently been a part of the zoning disputes between the welder and the town. But while some in Granby and most certainly those affected see him as a dastardly person, others defended him, noting how Heemeyer only sought to destroy buildings and wasn't trying to physically hurt anyone. At the time this incident happened, it became a worldwide news story, dominating headlines across the planet. However, the very next day, former president Ronald Reagan passed away, shifting the media's focus to the politician's life and legacy. What happened with Marv Heemeyer might have been pushed to the wayside as a result of Reagan's death, but his story is truly a compelling one that is many years overdue from being told. Tread paints the complete picture of Heemeyer's tragic journey, and the documentary is definitely a must-see movie if you have any interest at all in this bizarre story. The movie had its world premiere on March 8 at SXSW, and I highly recommend you give it a watch when it becomes widely available.